All the work you've done on your RST golf swing to this point has culminated in this next set of drills in the "5 Minutes to the Perfect Downswing" video. As with the other "5 Minutes to..." videos, a specific sequence and set of drills that can easily be done in your home or office is laid out in a simple to follow and easy to understand program that only takes a few minutes per day to get you moving forward and engraining the proper movement patterns. 5 Minutes to the Perfect Golf Downswing teaches you how to put all the pieces together for a powerful and effortless golf downswing. You finally made it. This is the graduation point for your golf swing. If you've taken the time to work through the Rotary Golf Swing program, you're finally ready for this most important video, "Five Minutes to the Perfect Golf Downswing". This video's going to include golf swing drills. 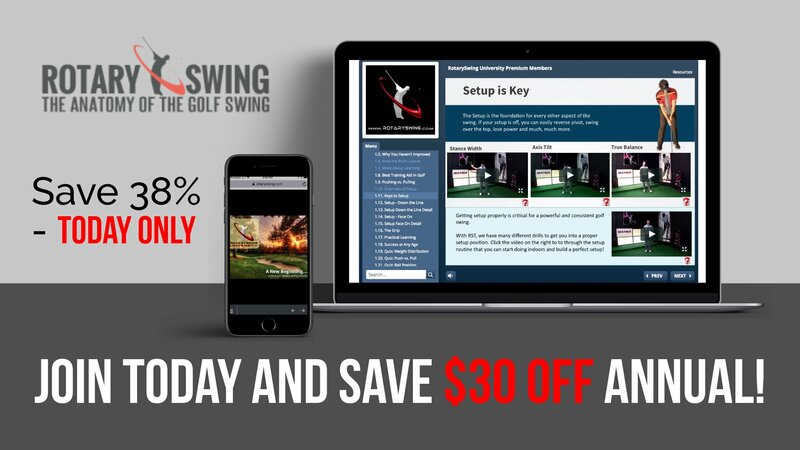 It's going to teach you to how to get into the perfect impact positions, how to sequence the golf downswing, and finally get the big payoff for all the hard work you put into getting the proper setup, get the golf takeaway right, the golf backswing right, etc. Let's get started because this is going to be the most fun stuff to work on and it's going to be the biggest payoff. First things first. What we're trying to do is get ourselves into a perfect impact position first. How we're going to do that is we need to sequence things correctly from the top of our golf backswing, and then we need to start checking ourselves into the golf impact position. Then we're going to work up towards getting some golf club release drills in here as well. This is going to be a lot of great work that you can get in every single day, just five to ten minutes a day, and get into a perfect impact position. What we're going to do, we're going to go to the top of the swing. By now you should be in a perfect position at the top of your backswing. If you're not, get out of here. Turn this video off and go back and start working on the other things. You're not ready for this yet. There's no point in getting here if you're not in a good position at the top. Perfect position at the top. The first thing we're going to do, squat. This is key because this is going to stop us from spinning. It's going to stop us from pushing off the right side, losing our tush line, losing our spine angle, getting the club trapped behind us. It's going to stop all those things and it's also going to allow us to leverage the ground and activate the glutes so that we can provide stability for the rotating upper body and the release of the club, and use the ground for leverage to finalize the snap of the release of the golf club at impact. As we come down, the first move is squatting. It's not spinning. Basically what you're doing is you're going from a turned position and squatting back to square. What that looks like at the top, top of the swing. Squat back to square. This is what you're drilling. Not trying to turn my upper body, not trying to move my hands, not trying to move the club. Simply going from the closed hip position to square. Squatting. Both glutes are activated and pushing, both feet on the ground, working my way over to the left. First move, squat. Notice that my arms have dropped. I didn't try and consciously pull them down. They should be moving down just due to gravity for the most part. There's a little bit of pulling in there, but they're pretty much getting a free ride by the fact that as you're moving your hips, that's pulling everything down. Here, squat. Now as I'm in this position and I'm continuing to move on to the left and really engaging these glutes, now I'm pulling down with the left and getting ready to fire with the right. I'm here. Now we can use our left hand only release drill, if that's what you're working on at the moment, because you're not worried about the right hand. You can get into your left hand golf impact position. Check your impact alignments, and release. If you're working on the right hand you can take the left hand out of the equation and get to the right hand release. It's ideal to train them independently if they're needing work. If both hands are great and you've taken the time to train them already, and you get into the right impact alignments and release, then keep both hands on the club. If not, work on one at a time. Squat, keep moving over to the left, push that left leg in the ground, and I'm going to do left hand release only. As I'm releasing the club, notice that my left leg is straightening through impact. This is critical. As we're activating our glutes in that squat move, what we're going to do to finalize the release of the club is I'm pushing my left foot into the ground using my glute. It's going to force the club to snap. My body's moving this way, the club's forced to move that way. It gets a more forceful release and it doesn't take really any effort. You're using big muscles here that are going to be firing anyway to provide stability. We can get a little leverage on snapping that release. Kind of think about your body moving in one direction while it forces the club to move in the other. Now I'm going to do the same thing, but now I'm going to take the left hand off and release the right hand. If you're in a perfect impact alignment you can go ahead and release it, and start working on getting the golf club to release. If you're not yet, you can use this "Five Minutes to the Perfect Downswing", squat into it, and stop at impact. If you have an impact bag, that will help make this even easier, because you can now check your impact positions by stopping against that impact bag. If you're not quite ready to release the club yet, just make sure you get the perfect impact alignments first. Then work up towards getting the release. Now we're starting to put everything together. We've got a great backswing, squat, we're leveraging the ground, pulling the arms down and releasing the golf club, pushing the left heel into the ground, and getting a nice snap and release of the golf club. In working on this, you need to work on it in sequence, in the pieces that are lacking in your swing. For instance, if you don't have the squat move down first and you spin your hips, don't worry about releasing the golf club yet. Spend each five minutes of your day that you're working on this just squatting down. At first you're going to do it really slow until you can really feel those glutes activate and then you're going to start doing it a little bit more at speed so that you get comfortable doing it in the context of how fast you're actually going to swing a golf club. Once you get comfortable with that, start working into hitting balls that way. Keep your regular golf downswing however it is. We're not going to be able to change everything at once. Then, once you've got comfortable and mastered that, start adding into the impact position. When I have my students hit balls, we try and stop at impact when we're hitting short shots. You'll go a little bit further, but the goal is to check whether or not our golf impact alignments are good. I'll have them stop right here at first and just hit really short shots. Their goal is to focus their energy and stop at impact. We're just trying to get into the right impact alignments. That's the next progression. As you start hitting short shots, you go all the way to the top, squat, come down slow, and stop at impact. Make sure everything's ideal at impact. Then start working into getting the golf club release. Now we can make short swings and get a lot of speed by putting all these together and getting a really good snap at the release. That is ideal for the nine to three drill. Now I'm going back, basically takeaway, I'm letting my wrist kind of hinge, and then I'm working on release. Putting all these little golf swing drills together, nine to three drill, the squat move, the impact alignments, left hand release, right arm throw the ball drill, it's going to help you start to build your perfect impact position and downswing in only five minutes a day. Work through these in sequence. Take them piece by piece, and you will have a perfect impact position and a great downswing for the rest of your life. Get Your Free Membership to Finish Watching "5 Minutes to the Perfect Golf Downswing" Right Now!